Hello lovelies! 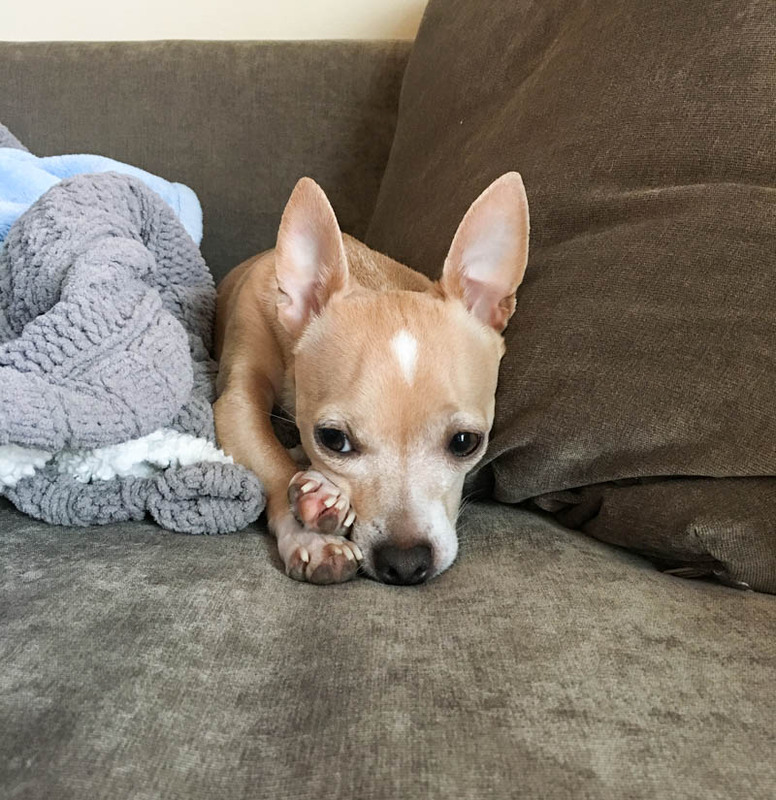 Look at that face though… I can’t even take his cuteness!! Hope your week is going fab. 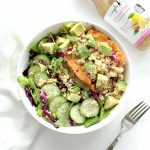 Let’s get into my yummy plant based eats for this What I Ate Wednesday. Every single morning, water, water water, before anything else, as you guys already know! I drink 24 ounces (3 cups) of filtered water every single morning, usually with 1/2 lemon (and I’ve been adding a splash of cranberry lately, just for fun!). I use this ginormous mason jar all day every day because no one cup is ever big enough?? Plus, I can measure out my water intake and try to drink 3 mason jars filled with water per day. Water helps to rehydrate the body after a long night’s rest when we get dehydrated and is so essential to wake up the body and start on the right track. Also, my skin looks so much smoother and stays clear! Then a couple cups coffee… hashtag coffee addict, with my fave non-dairy creamer (and you guys ask me all the time) so I use – the Silk Almond Vanilla Flavored Creamer (check out my superfood coffee elixir recipe too!). 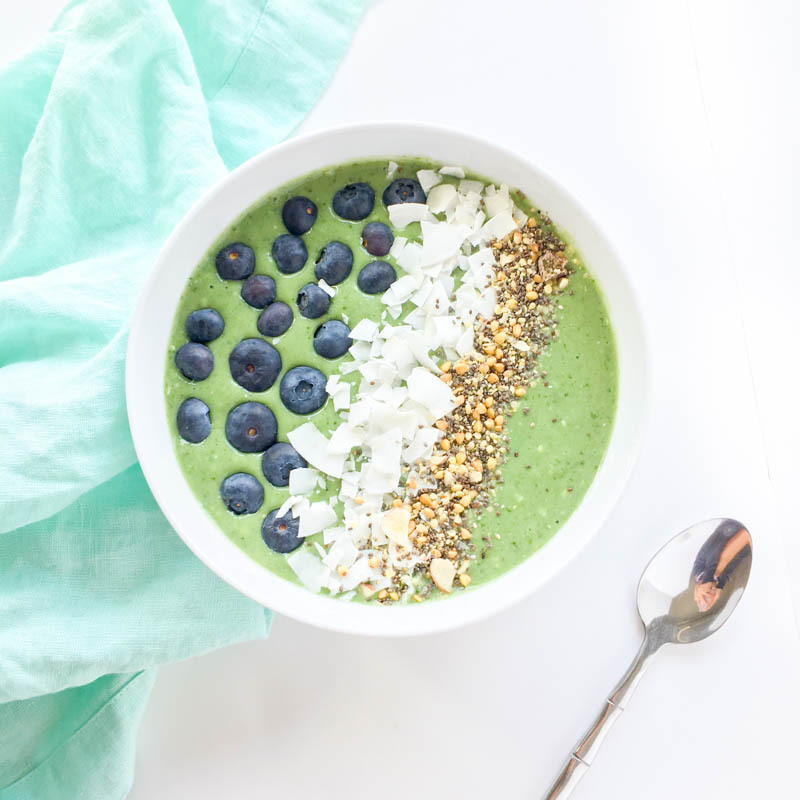 It was feeling warm and spring-like… so it was a Mermaid Smoothie Bowl kind of morning 🙂 this bowl has frozen bananas, spinach, avocado, spirulina, plant based protein and a little almond milk – topped with bloobs, coconut and chia superfood topping. Best smoothie bowl I’ve had in a long time! 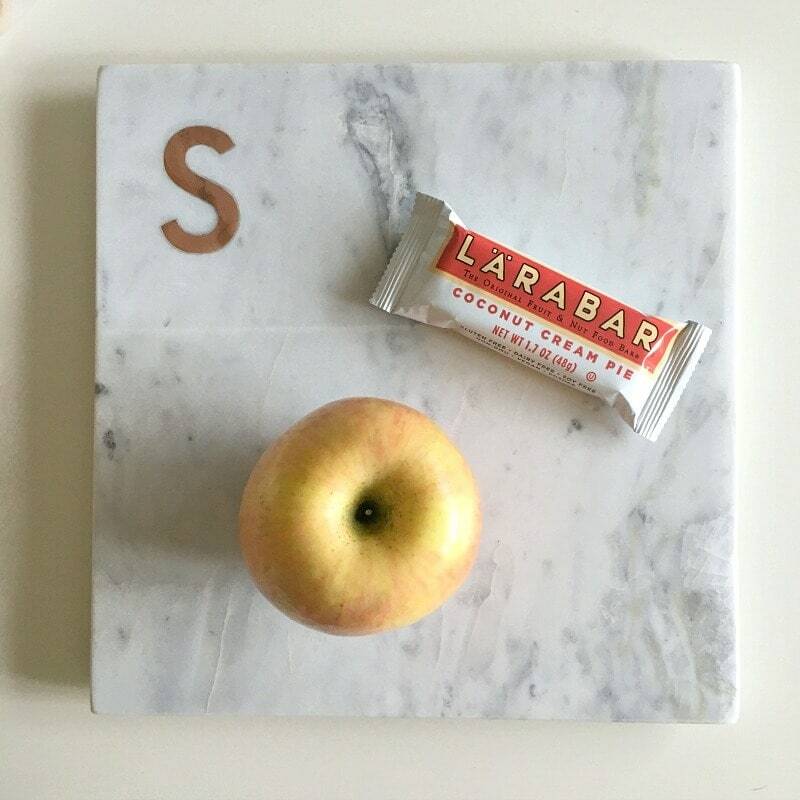 A little while later, when doing emails and working on my upcoming Meal Plan (which has turned into a 2-week plan), I snacked on an apple and coconut larabar! Lunch was a very typical glow bowl. 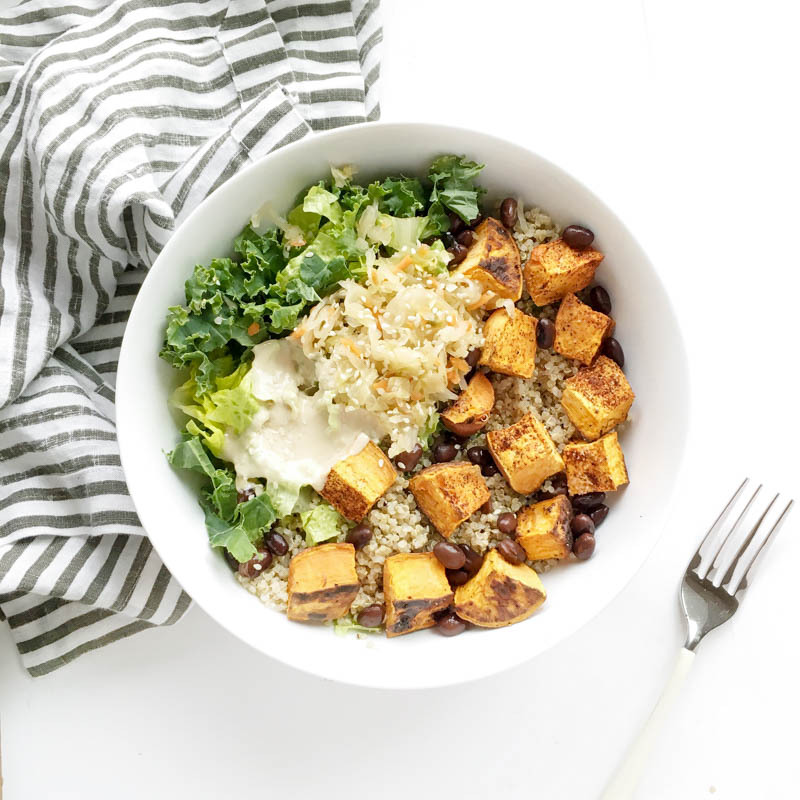 With a mix of kale + romaine, quinoa, roasted sweet potato (with paprika! ), black beans, probiotic kraut (from Farmhouse Culture) and tahini sauce (recipe here). The yummiest! 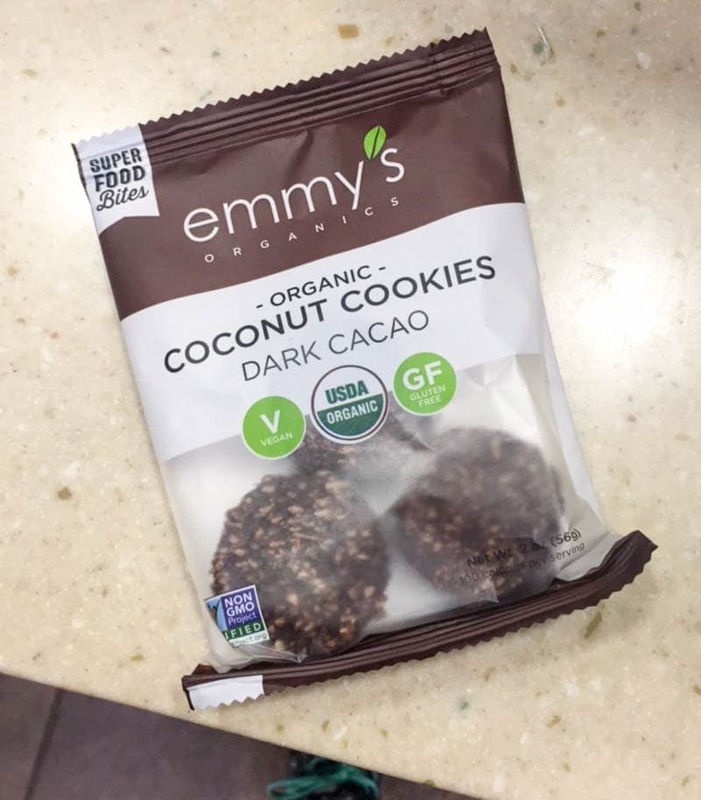 While making a quick stop at target, I needed a little pre-workout fuel, so I snacked on these Emmy’s Dark Cocoa Coconut Cookies . I pretty much died and went to heaven… these are amazing and I need to re-create them. After a booty workout at the gym, I made a bowl with a mix of brown rice, zucchini, asparagus and chickpeas with italian spices and lemon juice. 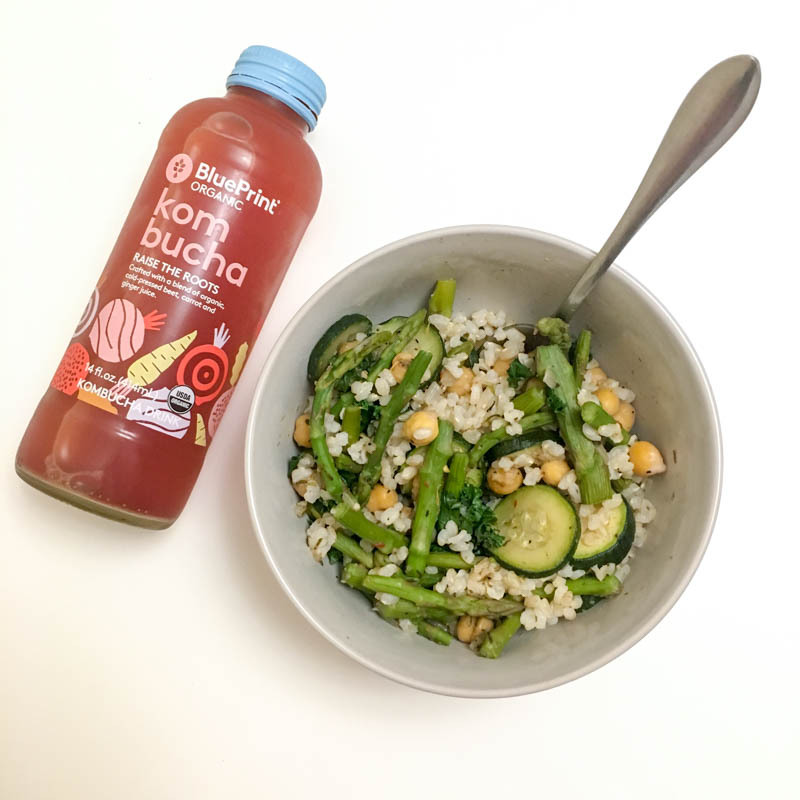 I had another small bowl after, along with this BluePrint kombucha which I loved. I had a small bowl of popcorn mixed with a handful of vegan chocolate chips afterward too… not pictured tho… too lazy ha. 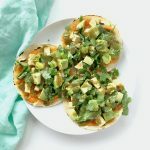 Did you make anything yummy this week?! Leave me a comment below! I love seeing your creations! Let me know if you tried any of my recipes and snap a pic of your gorg creation on instagram with the hashtag #theglowingfridge! Tag me in your pics on Facebook too so I can see them! where do you buy spirulina?